On this week’s podcast: Can the expertise and lessons learned in one startup ecosystem be used to benefit ecosystems in different cities and countries? That’s what Tim Ellis has spent much of the last few years doing. 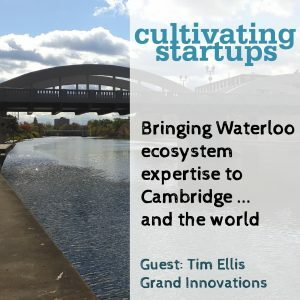 Tim is the former CEO of the Accelerator Centre in Waterloo and a long-time member of the Waterloo startup community. He has been taking expertise developed in Waterloo and sharing it with startup ecosystems internationally—including in Australia, where the University of Wollongong was so grateful for his help that they awarded him an Honorary Doctor of Science degree. He’s now also bringing that same expertise to Cambridge, Ontario, heading up the creation of Grand Innovations, a new innovation centre with partners that include the City of Cambridge and Conestoga College. Grand Innovations is scheduled to open a 50,000 square-foot facility in the Galt area in the next year. In the update: A look at the fate of Startup Calgary, the new Ontario Scale-Up Vouchers program, and Michael Litt’s column in the Globe and Mail on Vidyard’s efforts to resist gentrification in downtown Kitchener.